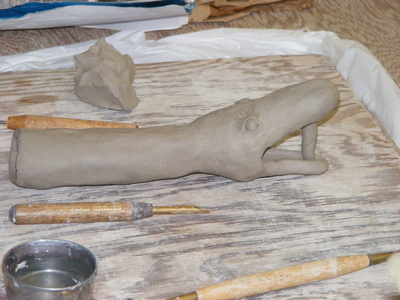 I have been working with sculptures for as long as I can remember. It was also one of my favourite subjects in art school. 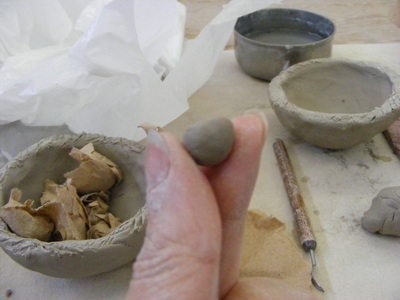 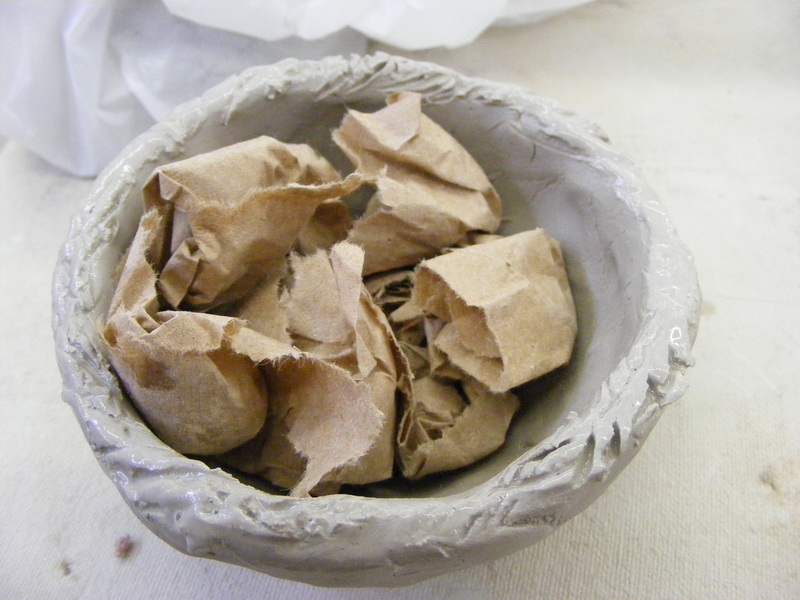 Because of my comfort level with clay and building methods, I am very willing to explore and try different things, and encourage my students to do the same. 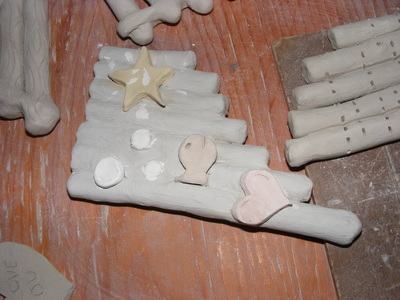 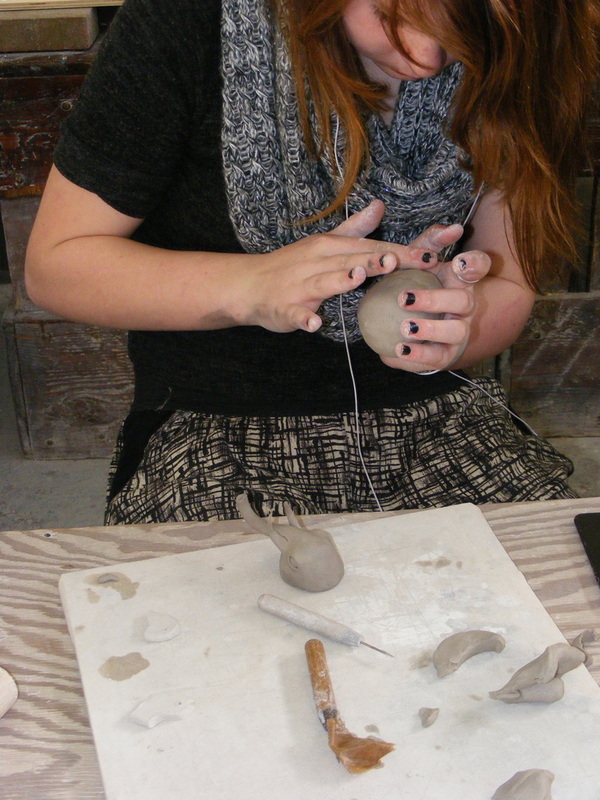 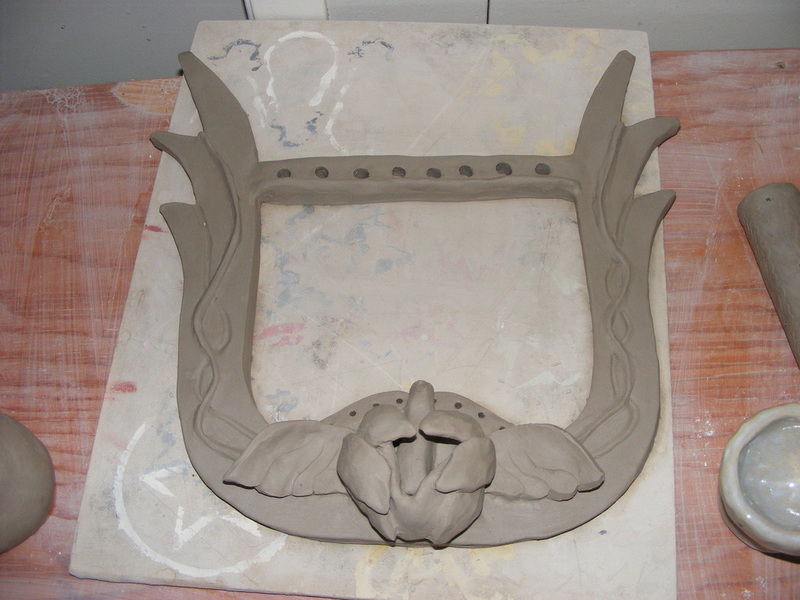 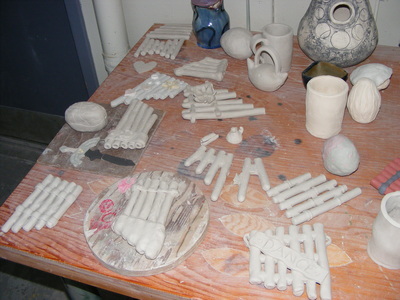 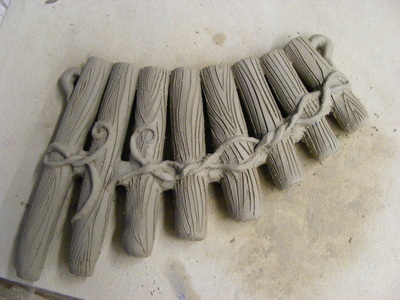 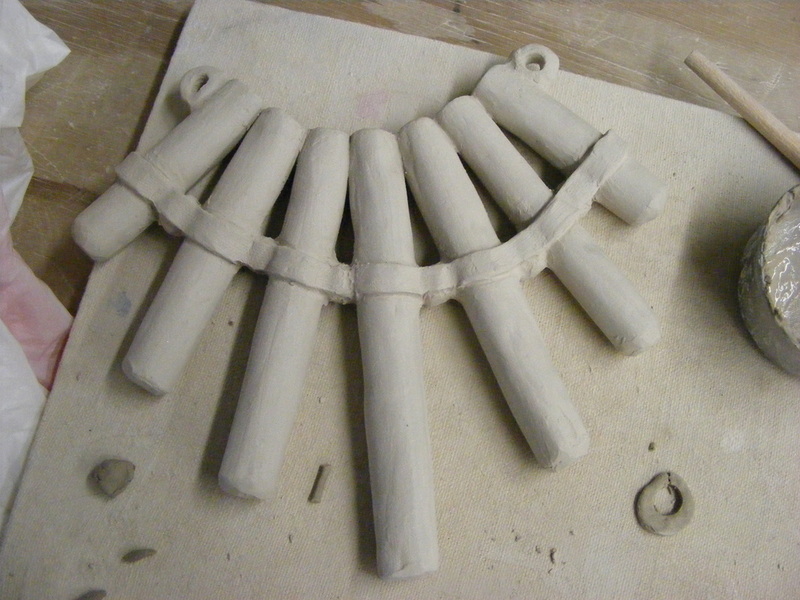 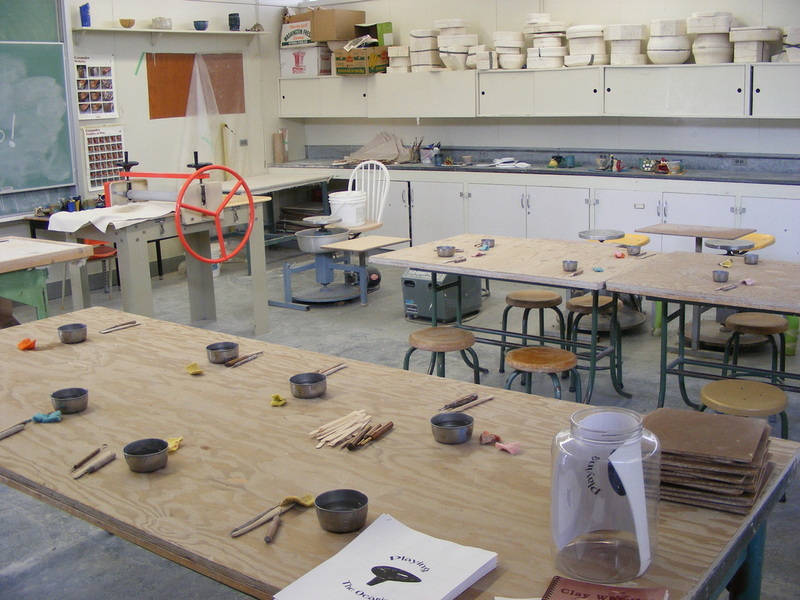 I love music; during my time at Woodlands, I was able to develop a whole curriculum incorporating music into ceramics.Below, you can read about my experience with Pottery 8 and Pottery 9-12, as well as see samples of student work. 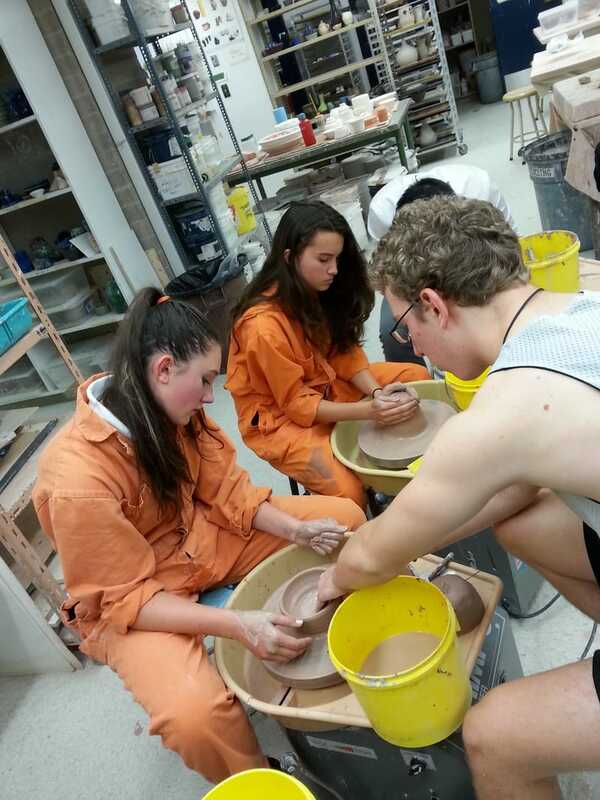 I orchestrated a Interschool ceramics club between York House and St. George's, happening every two weeks since 2015. 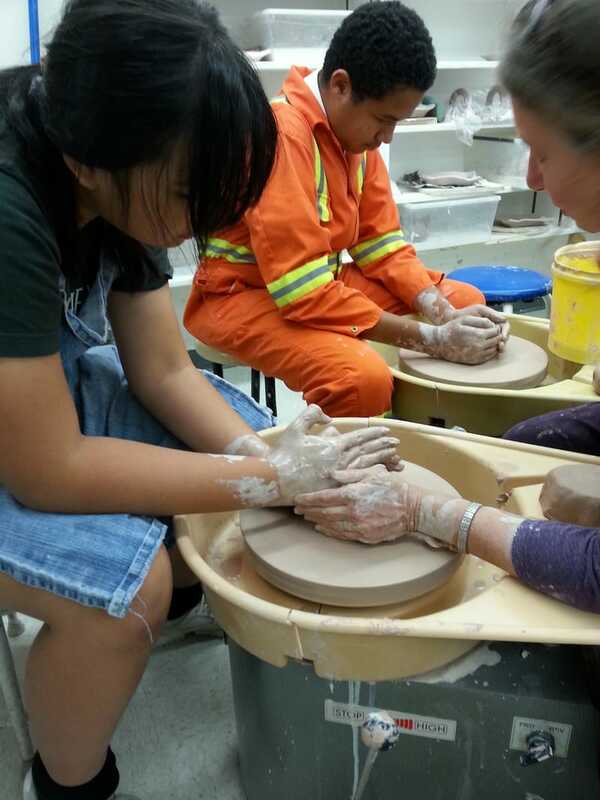 The girls and boys were able to create and learn from each other in a safe, pressure-free environment. 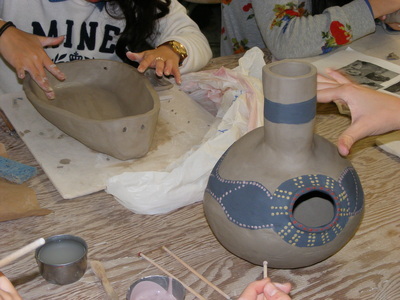 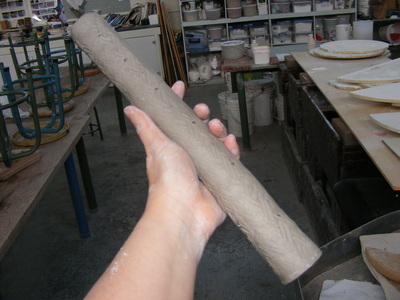 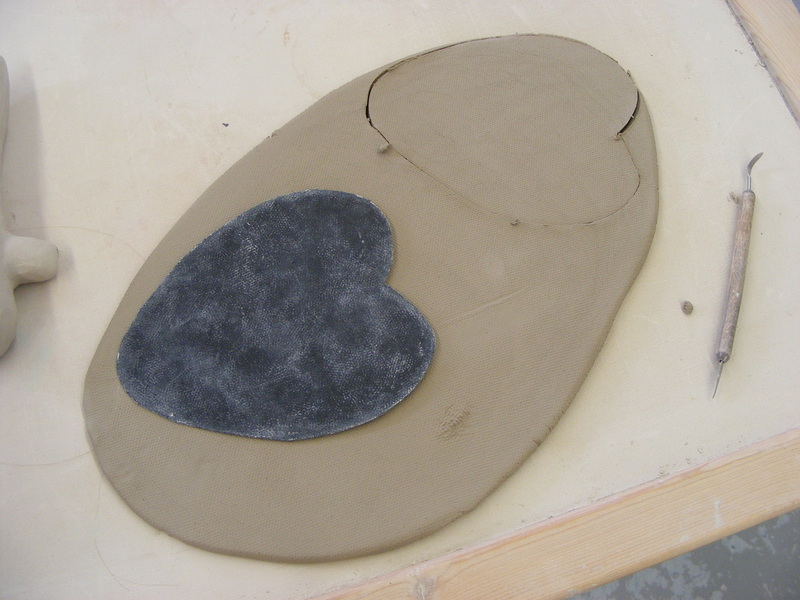 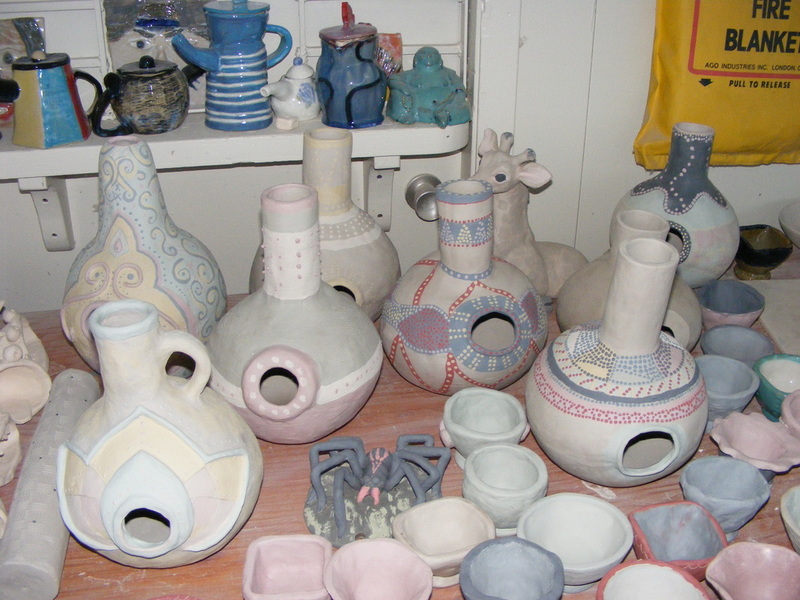 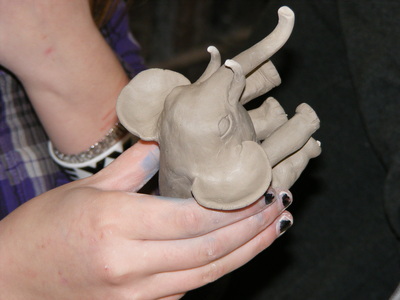 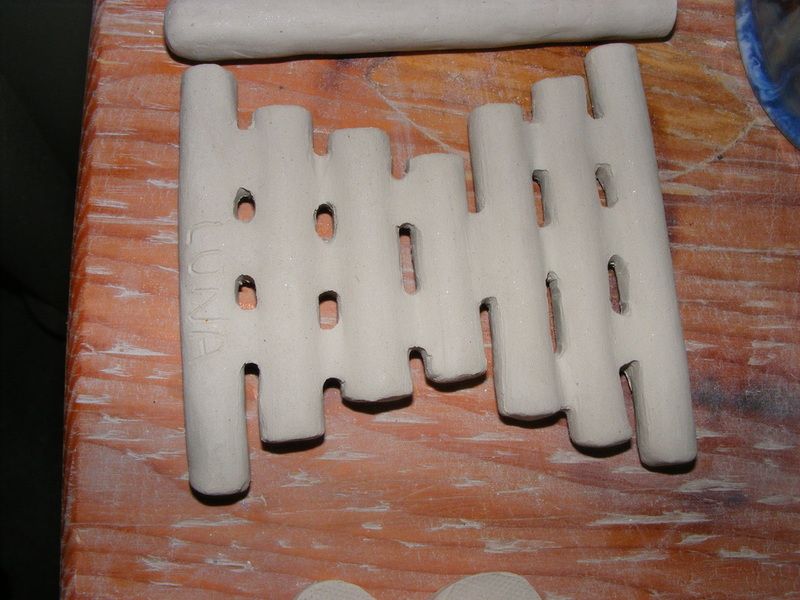 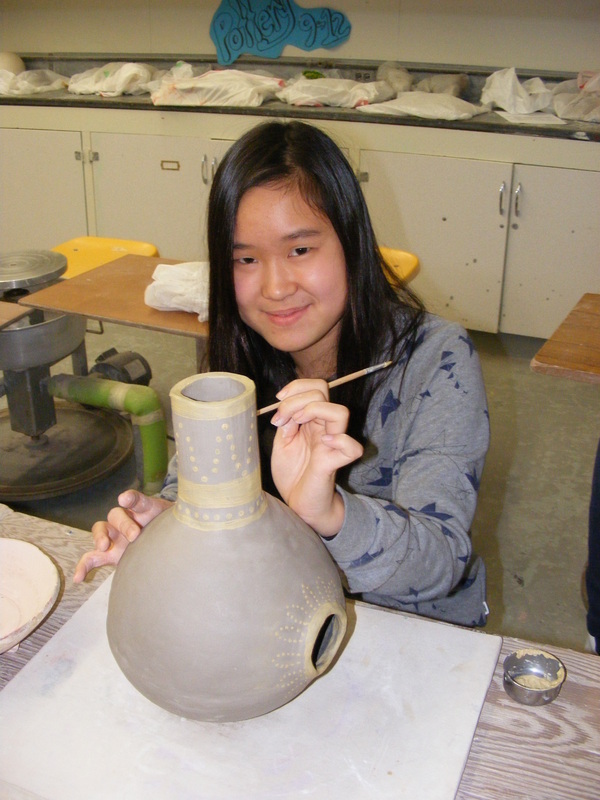 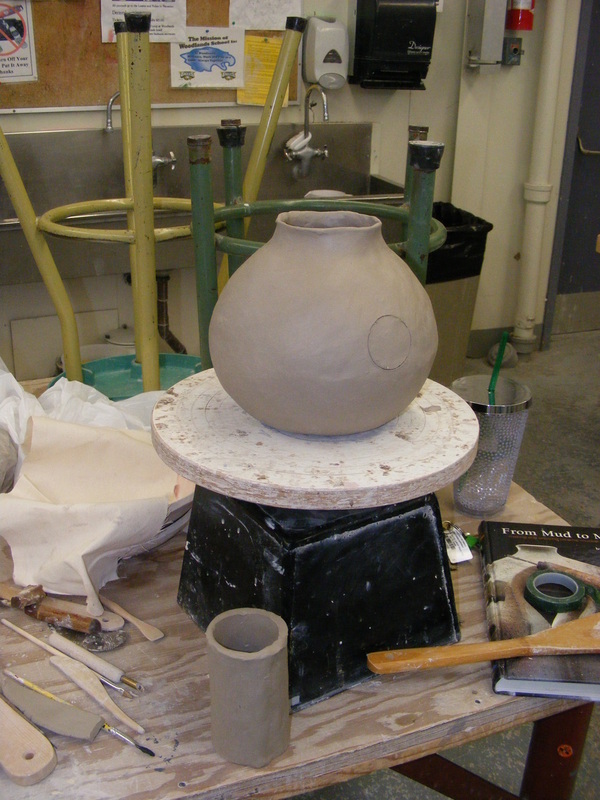 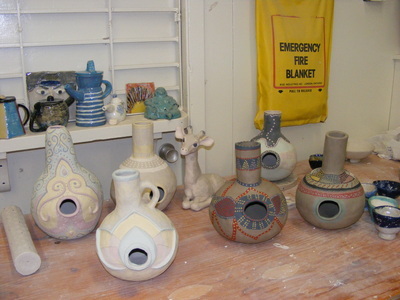 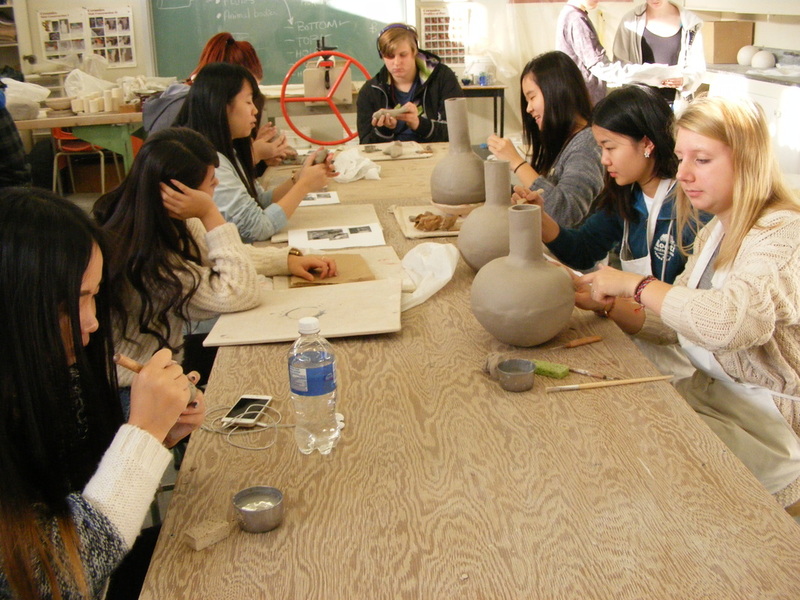 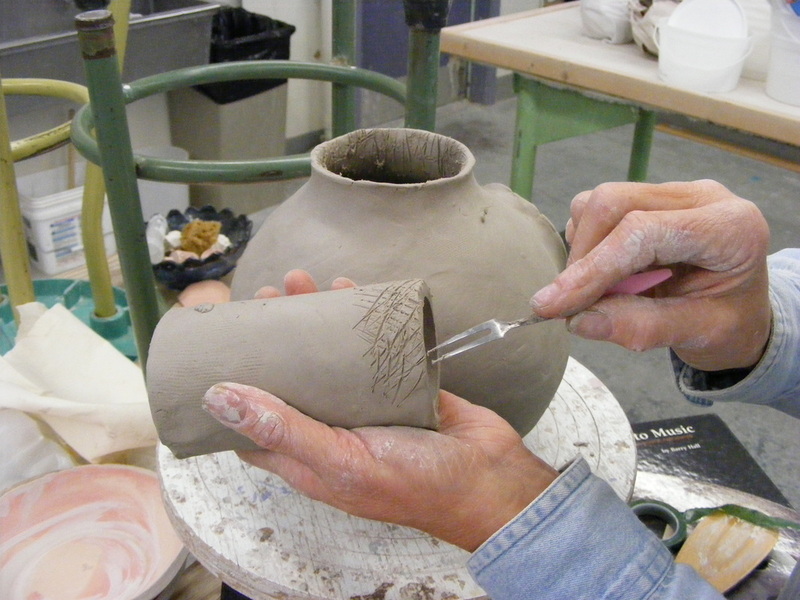 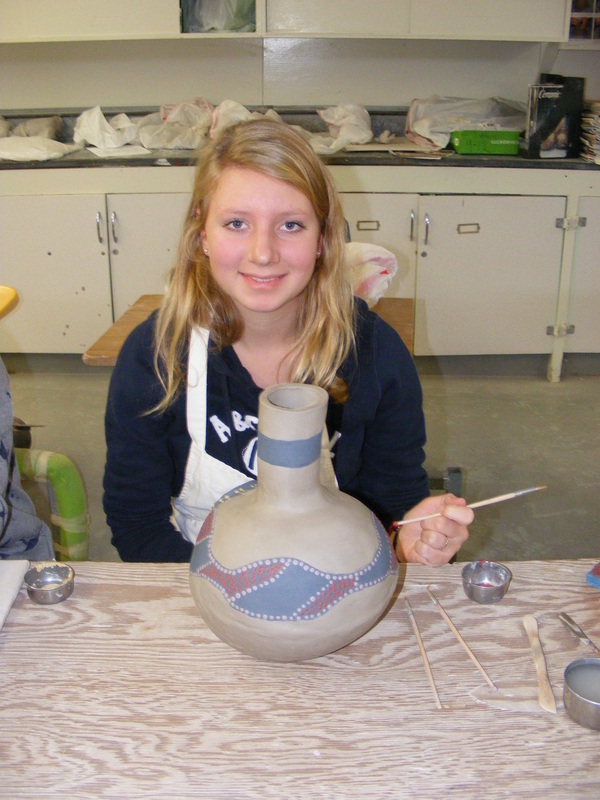 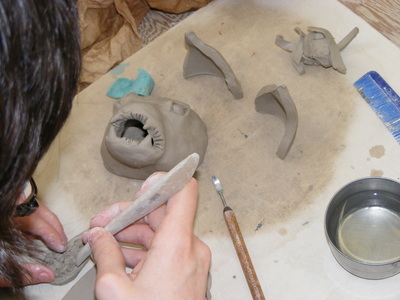 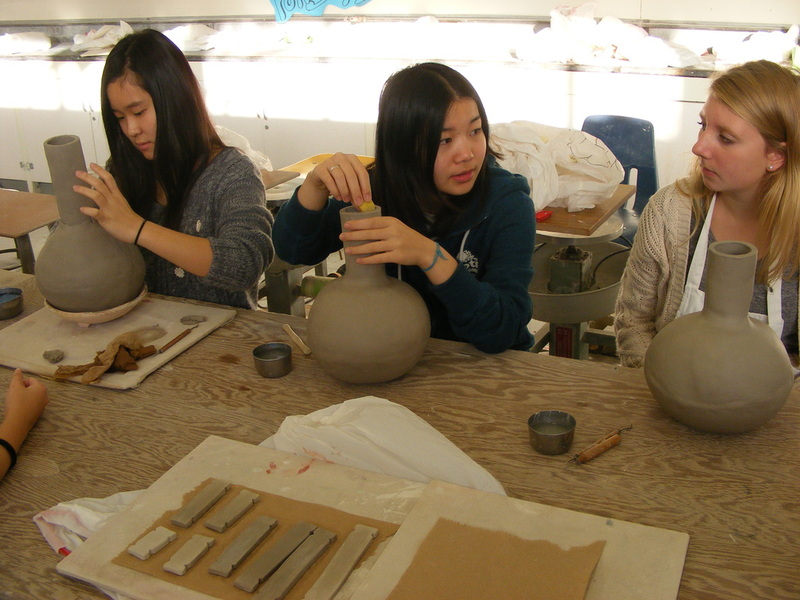 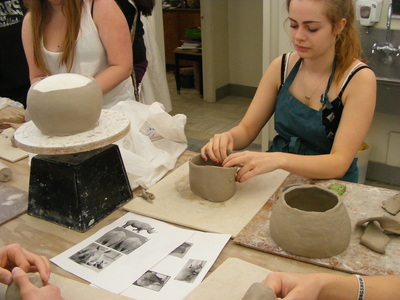 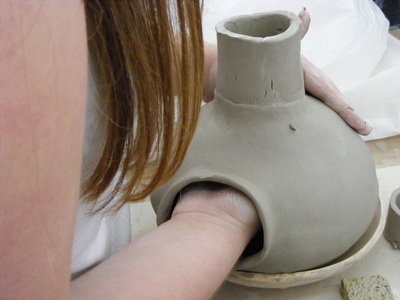 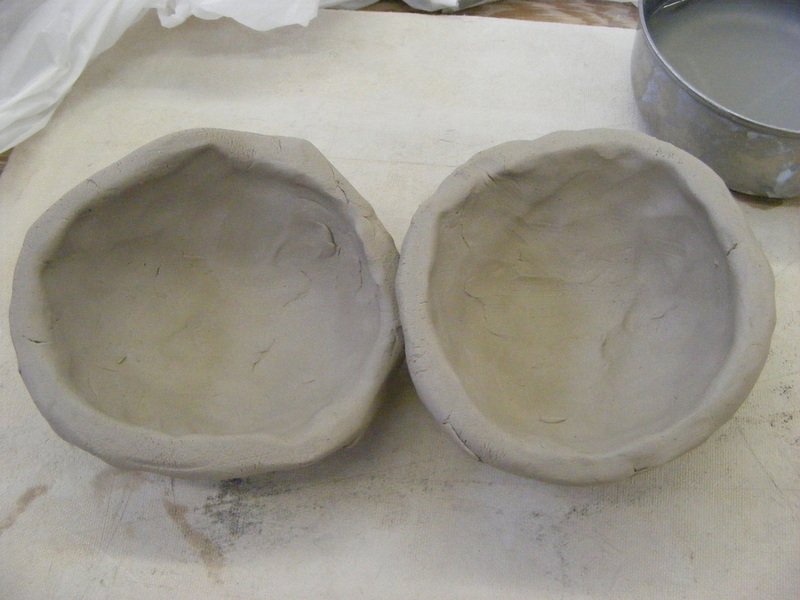 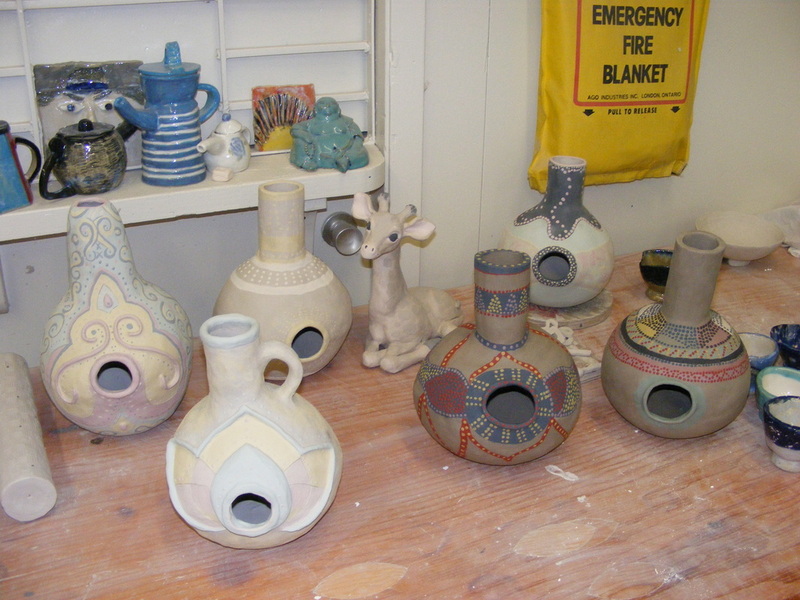 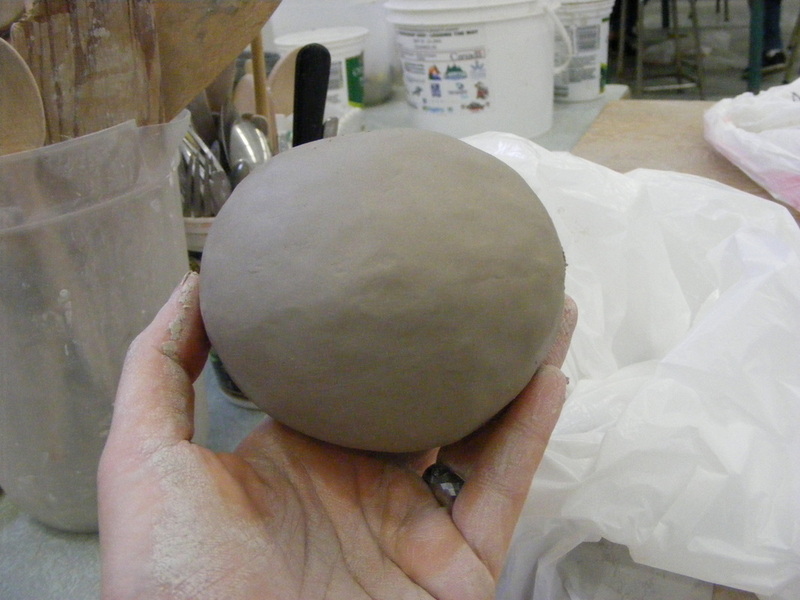 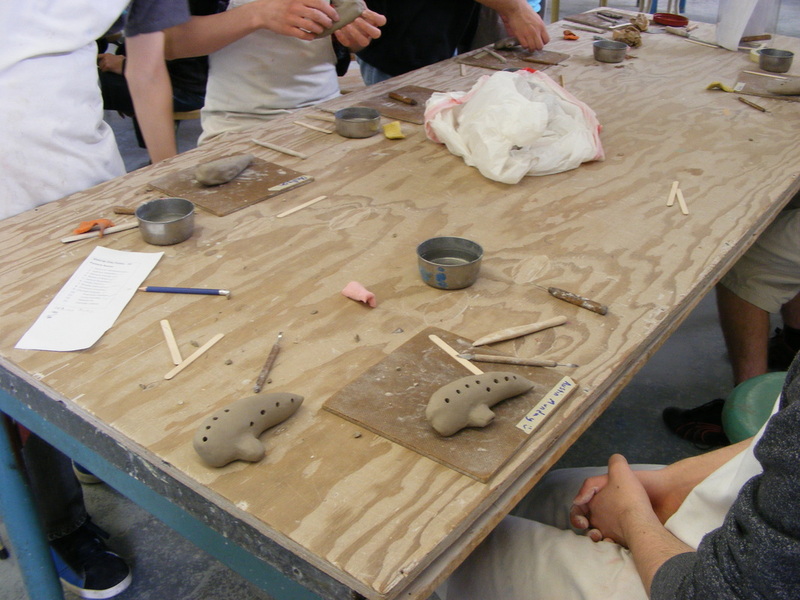 During grade 8 pottery, students usually learn basic building skills, such as how to make a pinch pot, score and slip, how to make a coil pot and basic slab building techniques. After doing some basic projects with them, I really wanted to do something a little more fun... 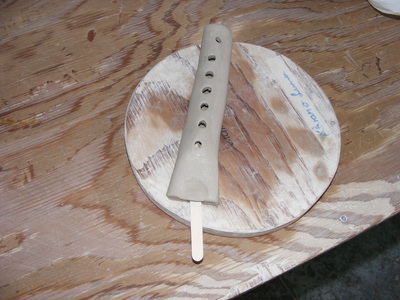 I wanted to build ocarinas. For that purpose, I designed a plastic template specially to ensure ease of construction and speed of clay distribution. 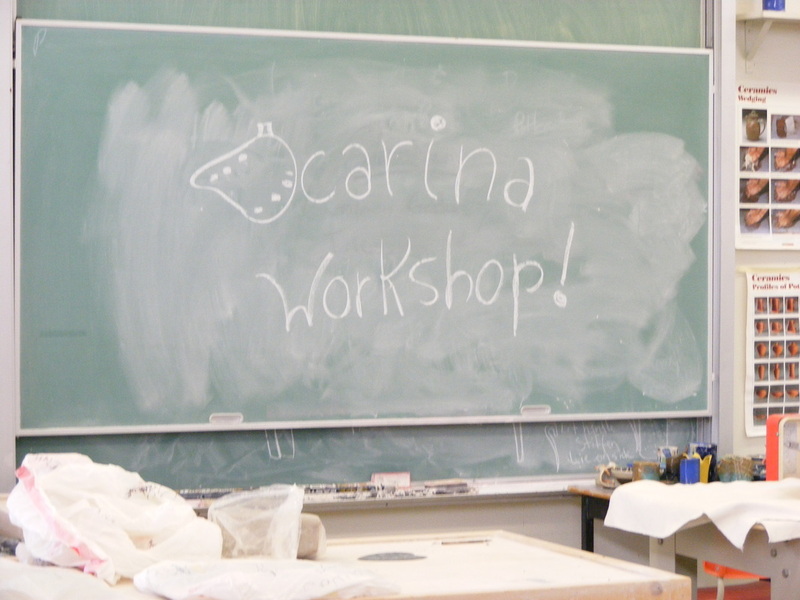 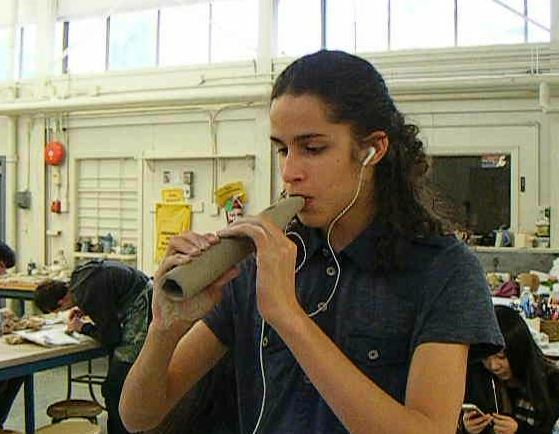 But I needed to make sure this project was a viable choice, and that it was possible to teach a whole class on how to build an ocarina, since it is a rather advanced project. 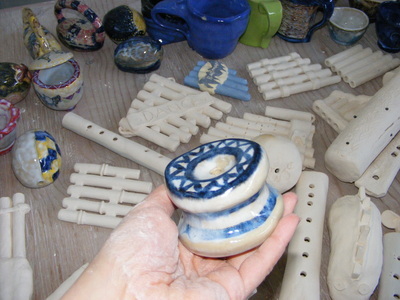 To ensure I would be able to teach the class and have enough time to build the ocarinas in one fell swoop, I decided to volunteer my time for an enrichment day; enrichments are offered in one hour blocks. If I was able to teach a workshop on ocarina construction and iron out any problems, I knew I could teach the eight graders. 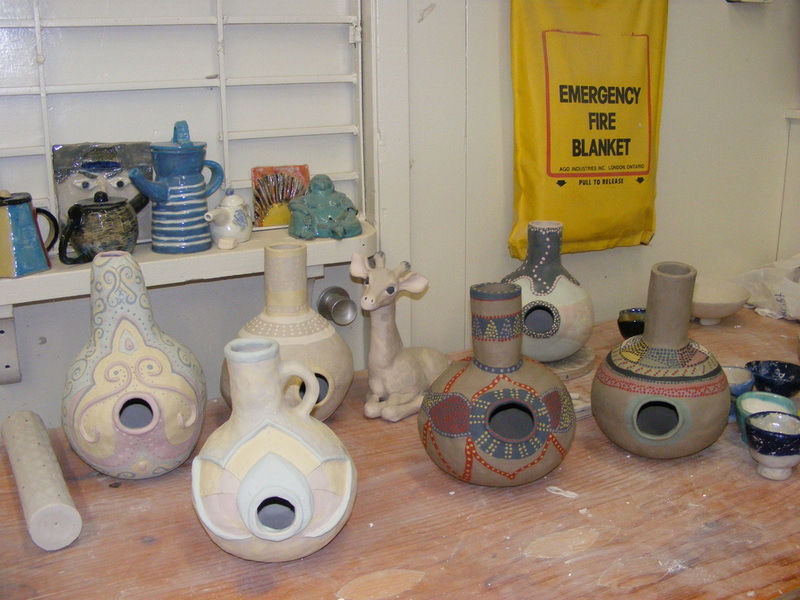 ... and to the left, the eight grade ocarinas, completed and ready to fire! 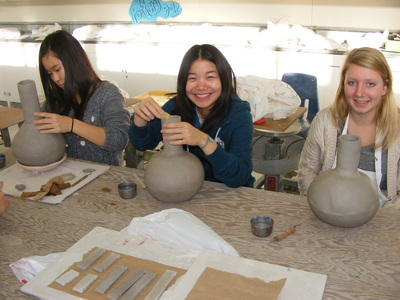 After the quick run with the senior students, the process went quite smoothly. The only thing that took time was ensuring each ocarina actually played in the end.It took me three hours to fix every single one of the 25 whistles for the ocarinas, and then to tune them more or less to a good scale... but seeing the students playing their ocarinas was worth every second. 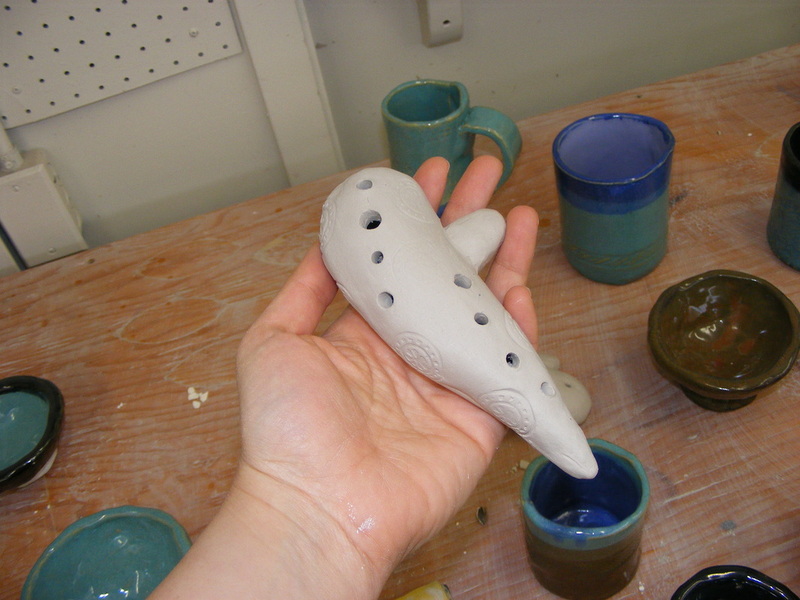 I built a few ocarinas myself, of course... 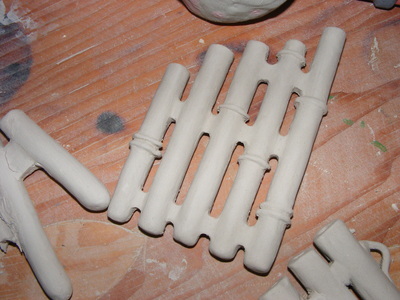 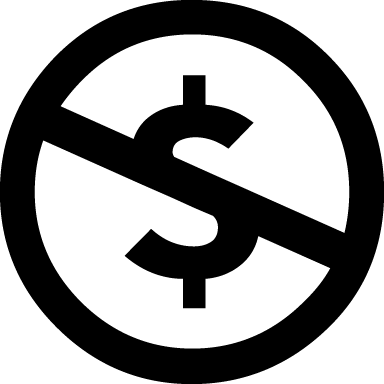 I love their shape, and could build them over and over. My favourite thing is how each one has such a unique sound, depending on how big the air chamber is inside. 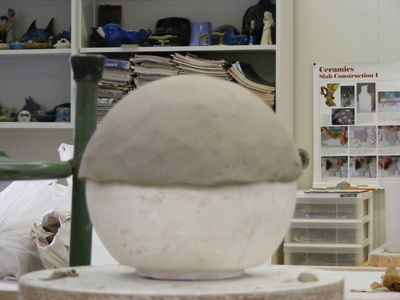 This one to the right is my favourite; it looks like a pod, or a turtle, or some sort of hybrid. 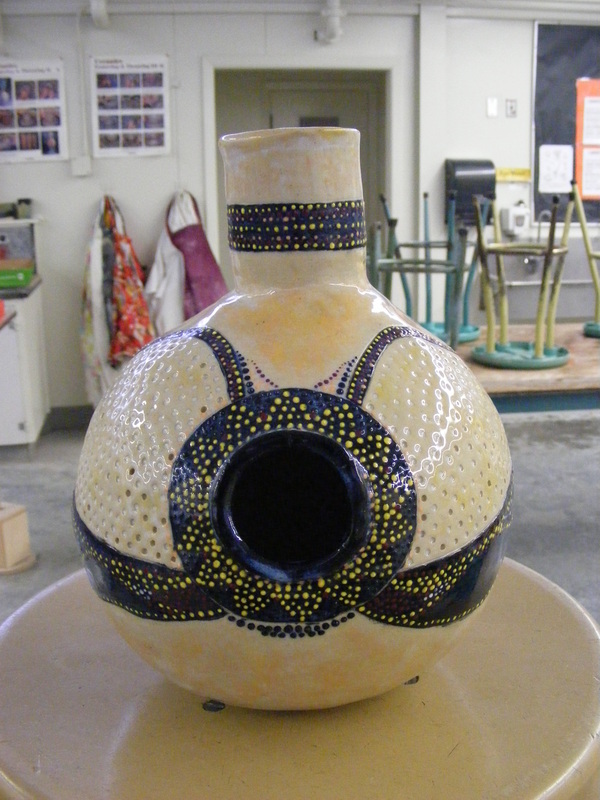 It has been glazed with turquoise after a black underglaze process. Besides the usual beginner's projects and the ocarinas, I also brought to the students a presentation about Brazilian pottery, and explained how ceramics was used culturally in Brazil; I brought a project in which students had to build their own clay bull, just like a traditional Brazilian ornament. 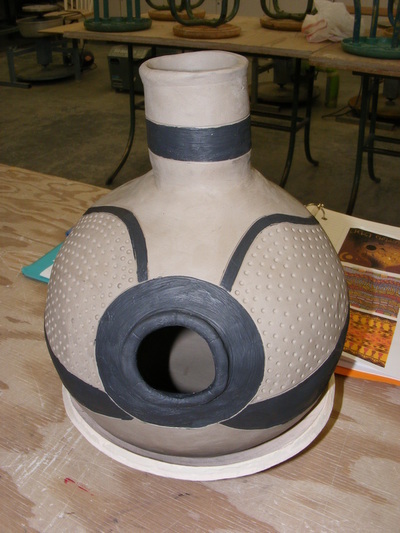 It is always fun to mix History and other cultures into art, but it was particularly fun to share my birth culture with the students. 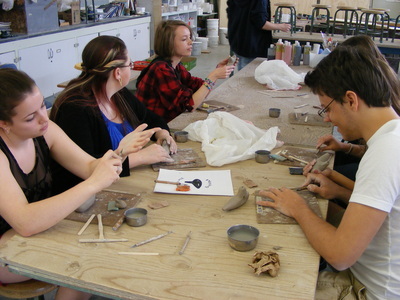 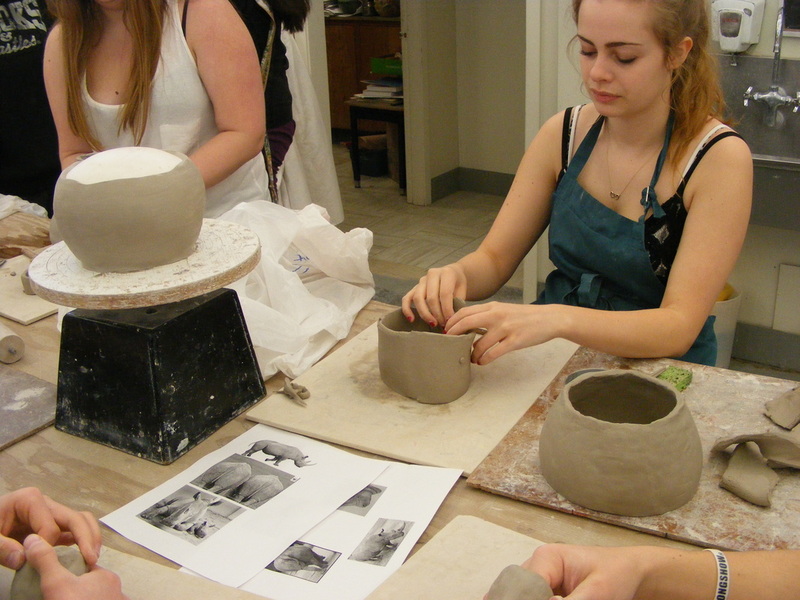 While pottery 9-12 is supposed to be a more advanced class, it still has to incorporate the basics because there are many students that have never been in pottery before. 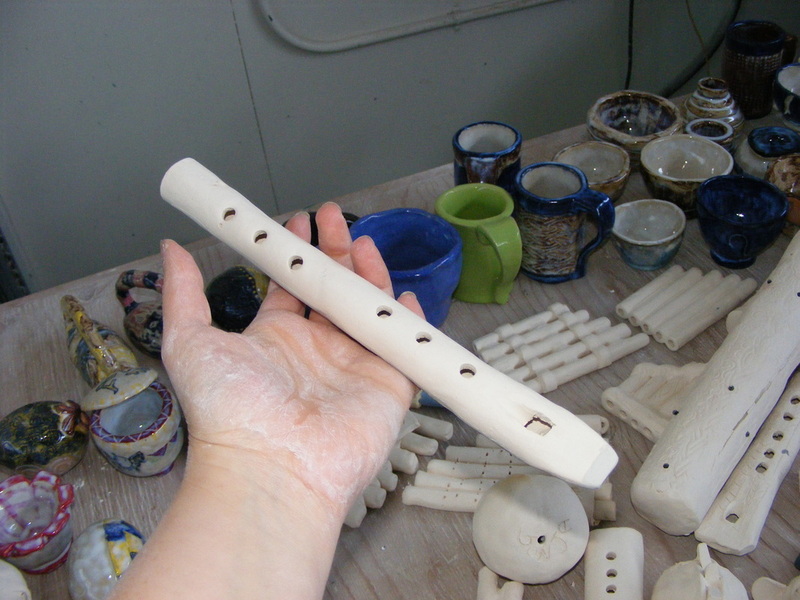 To continue with my musical pursuits from the previous semester, I decided to bring an African themed unit to the students. 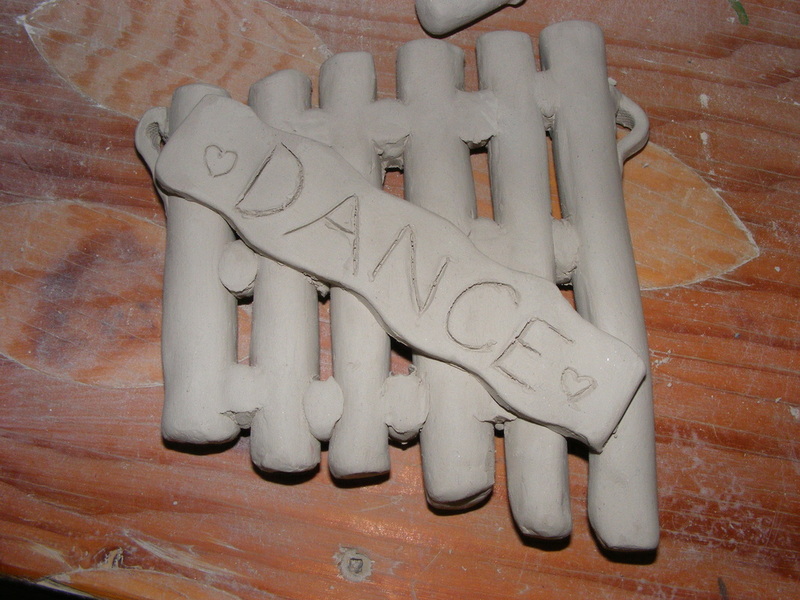 We started by visiting several countries in Africa and looking at similarities and differences in cultural aspects, as well as how they dealt with musical instruments. 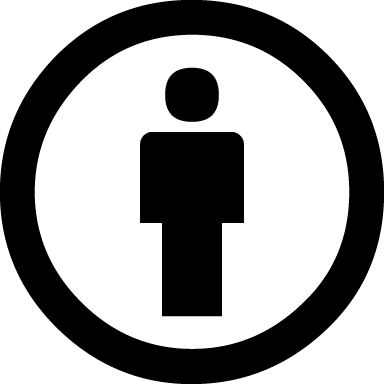 Students were able to visit the computer lab a few times throughout the unit to collect needed sources. 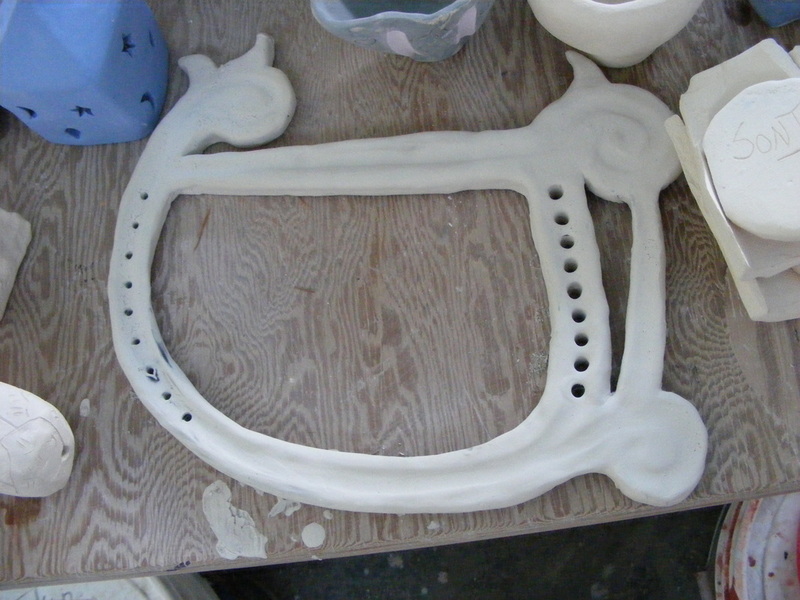 ...and moved towards making pan plutes, which were found in many countries, including Egypt (although ours were made with ceramics). 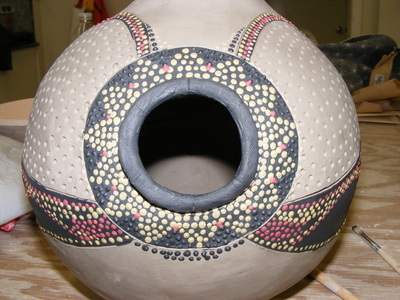 These could be decorated without African patterns, in any style the students chose. 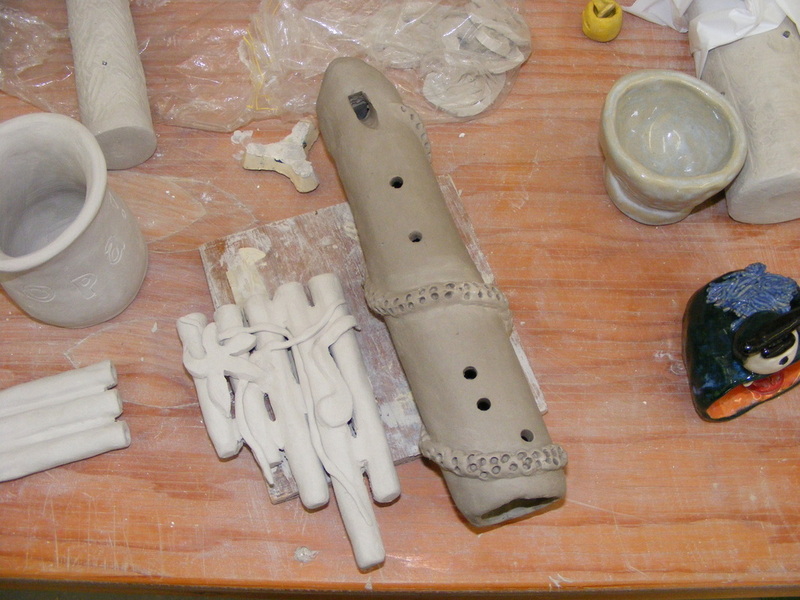 Finally, the students were introduced to their first inquiry project, in which they had to pick a musical insrument and build it out of ceramics. The sky was the limit, as long as the student did their research and tried their best. This was an amazing process. The class produced two lutes, several udu drums, one djembe with an authentic Turkish goat skin I ordered from eBay, five flutes, three rainsticks and a few more rattles and ocarinas. As a final project, students had to explore another inquiry project, this time creating a sculpture of an African animal of their choice and decorating it in a realistic manner. 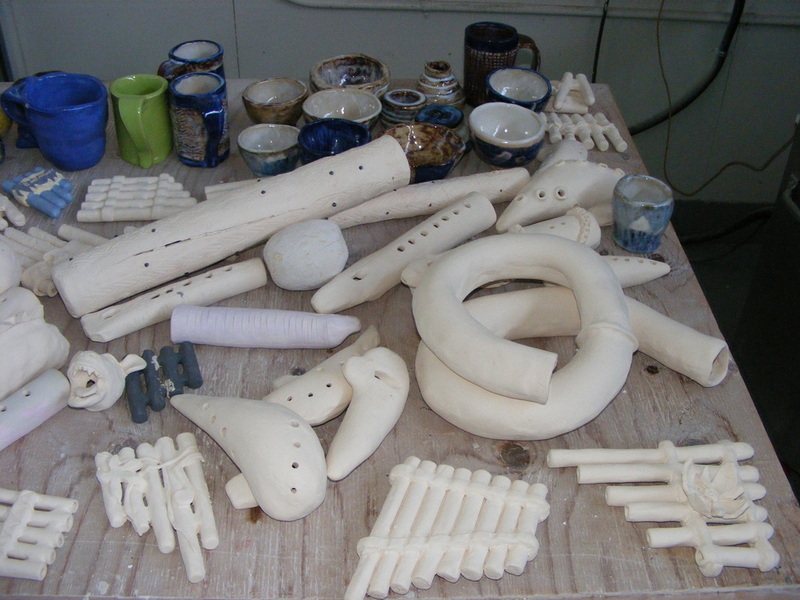 Below, the final result of our inquiry units: a beautiful display with animals and instruments. All instruments played very well. The students were very proud!